Which of your favorite albums is hard for you to look at? What great albums do you love that have ugly album covers or covers that totally clash with the music contained within? I’ve already written recently about the atrocious bubble-gum art that adorned the cover of Flop’s major label debut, so instead let’s turn to a much more famous act that also hasn’t learned how to make good album covers: Pearl Jam. The band has had a few duds, both musically and album-art-wise, but there’s a good reason one of its album covers has become notorious for being bad. 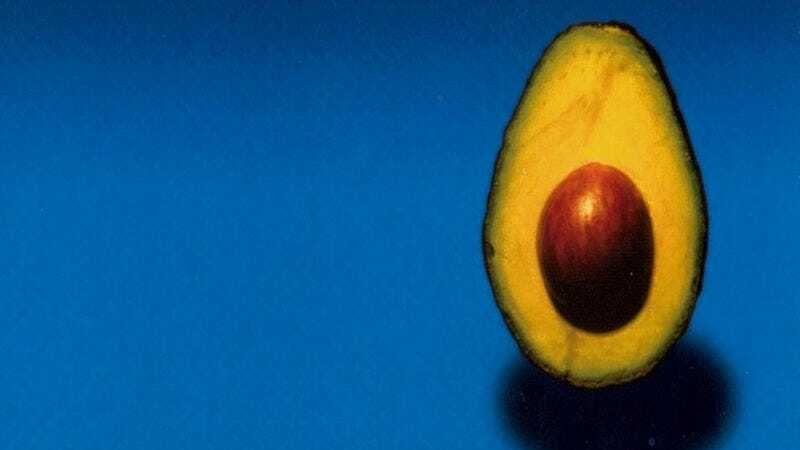 The cover of 2006’s self-titled record garnered justifiably mocking reviews, for the simple fact that it’s a damn avocado half against a blue background. The end. It’s awful and ridiculous in equal measure. Guitarist Mike McCready so much as admitted there was no good reason for the avocado, saying the thought process was essentially, “We’ve done such a good job on this record, and we’re kind of tired from it. Let’s throw an avocado on the cover.” The record is considered somewhat of a return to form for the group (even though it’s really only the first half—side two is uneven at best), but that cover, much like the fruit that decorates it, is terrible no matter how you slice it. In terms of appeal, this artwork is world-wide suicide. You can’t accuse the cover of Tom Waits’ Bone Machine of being tonally inappropriate, at least. The 1992 album takes the demented ramshackle carnival sound Waits adopted with Swordfishtrombones—the album art of which has a pretty neat backstory—to its most ghoulish extreme with smoky, disconcerting tunes about death and decay. For the cover, Waits straps on the goggles and horned cap from his “Going Out West” music video, and the resulting photo of his distorted visage is fittingly hazy and twisted. Conceptually, it’s a perfect match made in Waits’ weird bouncy hell, but I’ve never been able to take the cover seriously. Waits ended up looking like a maniacal donkey in mid-bray. The real culprit, though, is the font. That’s some of the worst, most aggressively ’90s font I’ve ever seen. It’s the kind of tacky disaster only the dawn of digital graphic design could spawn, and I can’t help but groan a little every time I see it. I started listening to Mew precisely because of its repellent cover art. When the band released its fourth album, And The Glass Handed Kites, I read several reviews stressing how good the record is and urging people to give it a shot, even though the cover art is pure nightmare fuel. I would have never been curious about it had this not been explained to me. The Kites cover looks like fan art made by a fan whose IP address you’d make a note of just in case. The image is a nesting doll of gnarled faces next to what looks like a recently expelled tapeworm that just so happens to spell out the band’s name. The cover definitely doesn’t represent the album’s beautifully atmospheric prog-rock, but then again, whatever music would be accurately represented by this cover is music I never want to hear. I love almost the entire Catherine Wheel discography, but with the exception of the blurry cover to the British band’s debut album Ferment, Catherine Wheel’s album covers are proggily atrocious. There’s a reason for that: They were done by Storm Thorgerson, a British artist who got famous doing album covers for the likes of Pink Floyd and Genesis. So while I count Catherine Wheel’s Adam And Eve among my favorite records, I can’t really stand to look at the cover, which features a bunch of naked people crammed into little cubby holes like some Ikea nightmare scenario. The only thing worse than a band putting itself on Mount Rushmore is a British band putting itself on Mount Rushmore. That didn’t stop Deep Purple from doing exactly that with its 1970 album In Rock—nor from making things even worse by turning the album title into a horrible, Spinal Tap-level pun. Judging by the cover alone, In Rock is a record any sane person would steer well clear of. I was definitely turned off by it for many years, even when I worked in a used record store and had numerous idle opportunities to check it out. But like one of my other favorite records with atrocious artwork, Neil Young’s Zuma (which I talked about a few years back when The A.V. Club was previously asked this question), In Rock is not to be judged by its cover. Not only is it the best Deep Purple record—a raw, feral document of the band in its first blush of true glory, yet one that leaves room for the operatic bombast of the legendary “Child In Time”—it’s a sterling specimen of proto-metal at its snarling best. Mount Rushmore? That’s pretty humble, actually. After learning to love In Rock, I’d vote to have Deep Purple’s faces carved on the moon. I remember, some years ago, my surprise when the The Hold Steady’s Boys And Girls In America was called out as having a bad cover in this feature, because that album’s explosion of hot soft light, sweat-wet confetti, and little lambs looking up at the camera seems like a perfect expression of the band at its most celebratory. Moreover, my go-to example of albums I love with ugly covers would be almost every Hold Steady album besides Boys And Girls In America. I mean, true, they’re not Yeah Yeah Yeahs Mosquito level heinous, but the photo collage of Almost Killed Me looks indistinct at best, the Brooklyn photograph and scribbly font of Separation Sunday are on the right track but don’t look correctly proportioned, and both Stay Positive and Teeth Dreams (the worst of the bunch) place way too much emphasis on type over image—and are awash in similar tones of brownish tan, no less! Heaven Is Whenever isn’t quite as bad (underrated record, underrated cover image! ), but it also kinda looks like a simplified retake of the Boys And Girls cover concept. They aren’t the ugliest album covers on my shelves, but I’m not sure if there’s a band I love more that has a worse overall track record. Staying positive, though: I recently re-bought Boys And Girls In America on vinyl in part because I love how it looks on a big LP sleeve.